Discussion in 'WildStar Classes & Paths' started by Xlugon Pyro, Nov 6, 2013. I think I've done it. 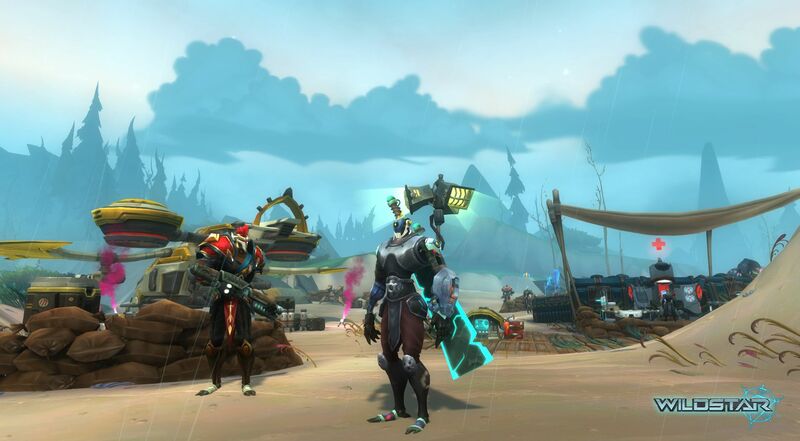 I'm certain that I've determined what the final race/class combinations will be in WildStar given various developer statements and screenshots we've seen thus far. What we've seen thus far, assuming that Carbine looks to make the race/class as balanced as possible, confirms that the human races will have 5-6 classes, two races on each side will have 4 classes (chua and mordesh confirmed), and one on each side will have three classes (granok confirmed). Excluding human races, both sides should definitely have 2 engineers and 2 medics as well. Dominion side this looks to mean that draken will get neither of the new classes since two non-human Dominion races have both of them (screens/pics with mechari wielding paddles and a rifle in another). Exiles have only one race that has both excluding humans (granok), which means mordesh get one and aurin the other to keep the balance between factions. I'm also certain that humans/cassians will be able to be all classes. This is bad news for me considering that my top two favorite races can't be the engineer as I was hoping, but at this point I'm pretty sure I cracked the code on the race/class compositions in WildStar. Good news is that I have a new crush on that granok girl from the warrior devspeak so maybe there's hope for me yet and the mordesh look to be getting the engineer as well and they're my third favorite race. Not all hope is lost but I am still disappointed. If you have questions or critiques, feel free to share them. The only ones I think that could change are aurin being medics with mordesh being engineers. To me it makes more sense for aurin to be medics over engineers, solving the puzzle of which race will get to play what. Sarpadon, Tribe, Domi Dayglow and 3 others like this. Looks good to me. My only thought as I read through it, and you addressed it at the end, was the Aurin/Mordesh switch. I think you're spot on with your reasoning for going the way you did though. I like how you think mah boi. I believe this is very logical and plausible. May I have a cookie now? My like cookies are pretty tasty. Take a bite out of this one. A bit disappointing for modesh only having one healing class since they are alchemists trying to cure themselves. I know a couple of my guildies wanted either medic or esper mordesh characters. Nadili and Xlugon Pyro like this. We already knew mordesh couldn't be espers. I also discovered that the healer/tank balance is just right across all races as well. Granok and draken get two tanks, one healer. Aurin and chua get one tank, three healers. Mordesh get three tanks, one healer. Humans and cassians obviously get three of each. A bit disappointing for modesh only having one healing class since they are alchemists trying to cure themselves. First...since when does Alchemist equals medic? When I look at the ''Meet the Mordesh'' I see them using alchemie + alot of technical stuff to keep themselves alive. So I can see the more technical side to it tbh. They are just ''Mordesh, Engineer, Scientist, Alchemist'' (proffesion). There you got your whole package! Second: The only race I trust less then the Chua medic would be a Mordesh one! I also discovered that the healer/tank balance is just right across all races as well. Granok and draken get two tanks, one healer. Aurin and chua get one tank, three healers. Mordesh get two tanks, two healers. Humans and cassians obviously get three of each. That's just it I only see one healing for mordesh rest being tank according to that list only spellslinger is heals. Yeah I did know they couldn't be esper so we were hoping for medic. What we've seen thus far, assuming that Carbine looks to make the race/class as balanced as possible... Exiles have only one race that has both excluding humans (granbok), which means mordesh get one and aurin the other to keep the balance between factions. I'm also certain that humans/cassians will be able to be all classes. Interesting. Has anyone else noticed that the Available Classes box in the individual race pages are now blank? Pyro is any of your conjecture based off of the silhouettes on the classes page? I think you meant "Granok" and not "Granbok". What are your two favorite races? What leads you to think that Mechari can be engineers or that the Draken will only have three classes? Will you link the screenshot(s) you mentioned please. Is this one of them? Because I believe that rifle wielder to be an NPC not a player. I've always felt that the Mechari were analygous to the Granok, not the Mordesh, though another WSC member recently disagreed with me on this belief as well. Whoops nice catch there. I'll fix that. But don't forget Mordesh and Mechari both provide intel support to their side, and the ''secret service''. That's why they are bound together. Draken - Grannok are just warriors bound by wanting to fight. That seems pretty medical to me. ._. Plus! Their alchemy is "the forbidden kind!" And yeah, I wouldn't trust a Chua healing me either, and they get 3 healers! No clue what that's about! I guess the Dominion is more progressive when it comes to medical ethics? I caught this when I was writing this up. Had to look at other sources to verify the class compositions prior to the beginning of the classes ultra drop. Either it's a victim of website changes or perhaps could mean changes to the race/class compositions, although I doubt the latter. My favorites are aurin and draken. Both don't appear as if they'll be able to be engineers which I suspect will be my class. It wasn't this image but this one is evidence enough of mechari being engineers. We also saw artwork on a mechari wielding paddles at WildStar events at certain conventions, which fills that hole. We also know that to keep things equal, a Dominion race would have to have only 3 classes as well to match the granok. We also knew that chua would definitely have 4 classes as would mordesh. It was the revelation of the pictures/screens of mechari wielding both paddles and rifles that made me formulate this list. Chua getting to be healers is frightening (from a Dominion perspective) and is hardly a "progressive" medical decision LOL. Also, here are some images I found of mechari with said weapons. I actually believe the Aurin will get Engineer and the Mordesh Medic. Why? Mordesh are pretty much the Exiles' masters of chemistry and medical science; to not have Medics would be kind of confusing. Aurin Engineers would be a mirror to Chua Engineers; tiny race with a big, big gun. If so I would <REDACTED> an ocean like crazy in happiness, but I see aurin being more into tech healing than into tech lasers 'n explosions, especially with them generally being pacifists while mordesh could go either way IMO. The contrast between them is why I feel the aurin will get medics instead of mordesh.